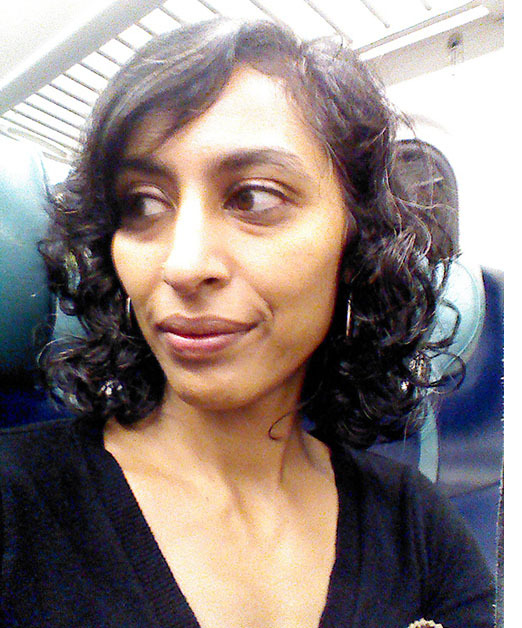 Priya Chandrasekaran has an MFA in Creative Writing from The New School and has been awarded a New York Foundation for the Artist Fellowship in Nonfiction Literature. Her short story “The Stops” was published in the Spring 2010 volume of J Journal: New Writing on Justice. She is currently studying anthropology at City University of New York where she is writing her PhD dissertation. I really enjoyed Two Women. The detailed, poetic descriptions create a very vivid image for the reader. What influenced you to write the piece? As with much of my fiction, the words just began to flow from me. I was compelled to write them down. I think it was Alice Walker who said that writers are mediums for their characters; to me that rings true. My fiction is very diverse – I can’t say I have “a voice.” The characters and the way they emerge out of me are inseparable. Of course the words change in the process of revision — sometimes almost all of them. But the feeling, the cadence, the aura, the pace of a piece often resides. I wrote this first chapter after returning from India and visiting my ill grandmother. Though none of the particular events I describe transpired, I was haunted by the shared despair of grief, even for someone who has lived long or lived well, as well as by the chasm in how people are able to care for those they love simply based on their position in society. Before writing Two Women you wrote mostly nonfiction. Why did you decide to start working on a piece of fiction? I have written both fiction and nonfiction for a long time, and initially I was writing poetry. It’s true that before beginning this chapter, I was completing a book of literary nonfiction based on my time in Peru. But even then, I was writing stories. For me, the gift of fiction is that it is an exercise in intimacy and humility. It compels you to get inside the skin of another being, to lose yourself so to speak. I am a better person for the effort, and I hope to always return to it. Just the first chapter of Two Women was published in Silk Road. How is the rest of the novel progressing? I have to say the project is on hold for the time being. I just returned from a year in India for fieldwork in cultural anthropology. But I can already see how the fieldwork experience has brought me closer to these characters and the lives and worlds they inhabit. They are waiting for me to meet them again. When did you first get into writing? What made you want to be a writer? You studied Anthropology. How has that influenced your writing? I’m still studying anthropology, and currently writing my PhD dissertation in anthropology at the Graduate Center of the City University of New York (CUNY). I see no divide between my anthropological pursuits and my literary ones – both have to do with being an ethical and political being in the world, with understanding myself in relation to others – not just personally but as someone who is part of a moment of history, who contributes to that moment and its future possibilities. I can’t see characters outside of the reality of social, economic, political realities that divide and connect people. I’ve always sensed that my labor towards a more just world would be quiet, but that’s not for lack of ardor.